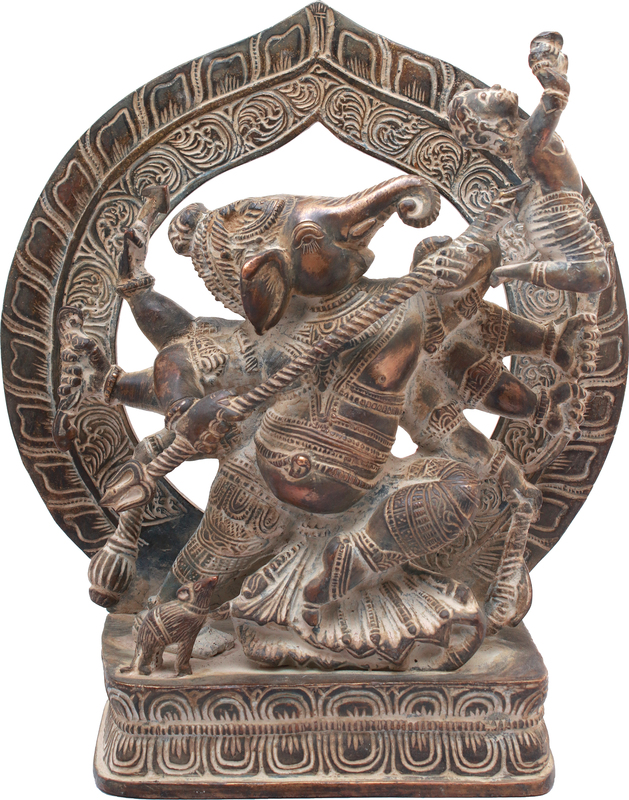 9.5" X 8.5" X 3.0"
This exceptional Ganapati image is a synthesis of his Vijaya-Ganapati, Mahaganapati and Vighna-Ganapati form. It is unique in both, extremely fine iconography and details, and strong sense of perception. 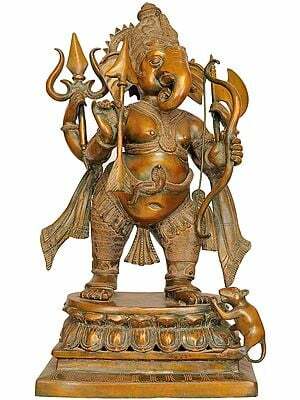 In his iconography Ganesha carries various weapons including a battle-axe but is not known to have ever used them. He is a delightful god always engaged in auspicious acts and bestowing bliss. He is known to have shown only once his displeasure when the moon made fun of him and for this misdeed suffered his ire, but even then Ekadanta Ganapati charged at him only his broken tusk, which too he withdrew when the moon apologized. Hence, a representation in which Ganesha is seen hitting and eliminating a demon-like figure by his trident is not only quaint but also exceptional. The force with which the tiny lord is seen charging at the demon is unique in Ganapati iconography. His entire form seems to charge along his weapon. 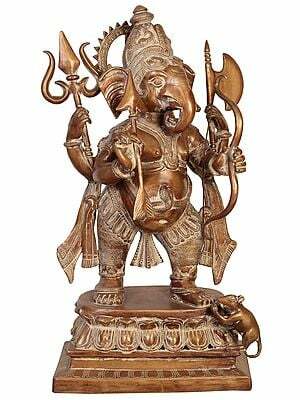 In Indian thought Ganesha or Ganapati has been conceived as the lord of 'ganas' or 'vighnas'. The Yajurveda (23/19) has invoked him as 'Gananama twa Ganapati', that is, the Lord of 'ganas' is Ganapati and further 'namo Ganebhyo Ganapati', that is, O Lord of obstacles, we salute Thee. 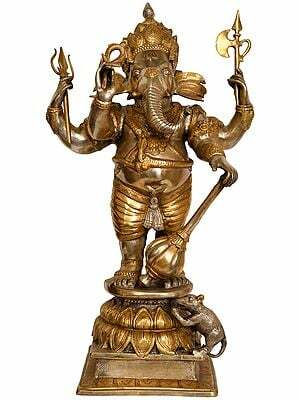 His other popular name is Vinayaka or Vighnesha, the lord of 'vighnas'. Maudagalya Purana elaborates thirty-two forms of Ganesha. Most of them describe him as remover of impediments. Brahma Vaivarta Purana invokes him as 'Vighna nighna karam', that is, he is one who eliminates obstacles. The forces that symbolise impediments, obstacles, hurdles, difficulties, troubles and all that is deformed and ugly is known in Indian thought as 'vighnas' or 'ganas'. As the legends have it, 'ganas' were creation of Lord Shiva who was their master. Shiva, as a compensation for beheading Ganesha out of ignorance, nominated him, after he had been brought back to life with elephant head transplanted on his torso, as the Commander of his 'ganas' and named him Ganesha meaning the lord of 'ganas'. 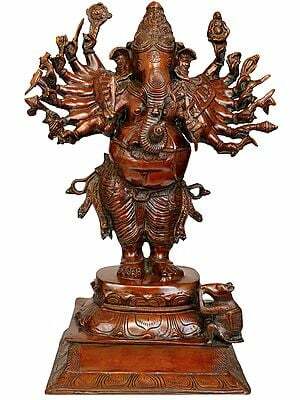 Obviously, it is the 'vighna', personified into human form, which the eight handed Ganapati is seen hurling into sky with his trident and massive bodily force. 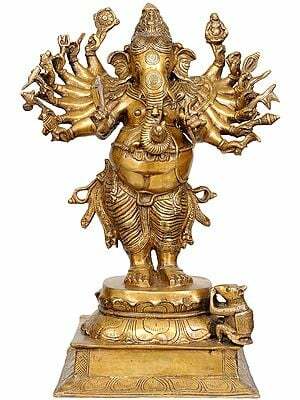 Ganapati's body language has been wondrously depicted despite a tough medium like brass. Such representation of his Vighnesha form is very rare but as much characteristic and symbolic of him in his iconography. 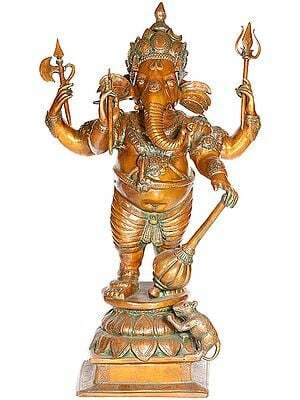 The remover of 'vighnas', Vighnesh Ganesha, is adequately armed - bow, arrow and mace in his hands on right and trident, dagger and battle-axe on his left, against detrimental forces. Such lavish ornamentation as adorns this Ganapati image is rare and quite tough for brass craftsmanship. Even the best of Chola bronzes are not so well adorned. This form is more akin to Nepal bronzes. Every bead, lace, thread has been carved so meticulously. The folds of his 'dhoti' are both, interesting and artistic. Even his tiny mouse is possessed of a bull's splendour. The fire-arch and pedestal too are quite splendid.